Keng hwa flowers in bloom during the mid-autumn festival. The Mid-Autumn Festival was a couple of days ago, and we were thrilled to see that our little keng hwa plant was set to bloom during that period. If you’re a regular here, you know that we love to wax poetic over our keng hwa flowers, and we thought it was a rather auspicious thing to happen during the harvest festival. Recently, though, thanks to the movie, Crazy Rich Asians, there’s been heightened interest in the flowers. Friends have joked that we should throw a party when the flowers bloom, even going so far as to suggest selling tickets when they heard that we expected multiple blooms! Well, it was just my mum and sister, and I, who were fortunate enough to be out in the bright moonlight, appreciating the flowers as they began to open. I didn’t expect to be so lucky, but four flowers opened that night (the previous “best” was three). They were on different parts of the plant, facing different directions, and I don’t know if it was by design, but the first flower that opened was facing east, followed by the next in line towards the west, and so on. 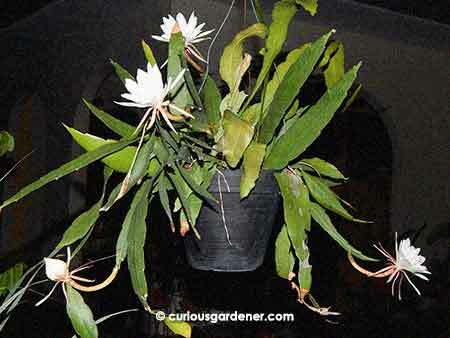 This variety of the night blooming cereus is somewhat miniature compared to the “regular” plant, and doesn’t have a very strong perfume. 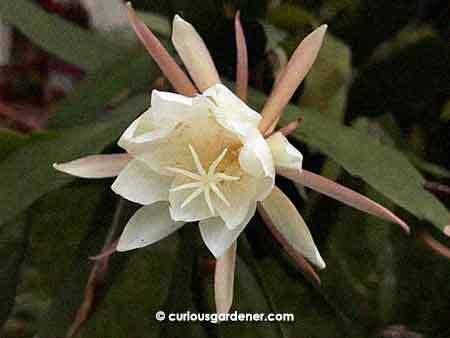 In comparison, when the normal plant bears a single flower, the scent drifts through the entire house – from outside! It’s our usual alarm when we don’t realise that the plant is going to flower. The smaller variety, though, has a very delicate scent that isn’t that noticeable. However, with multiple blooms, the air around the plant was filled with the gentle perfume of the flowers. It seemed very apt in the moonlit garden. Sometimes, the flowers bloom in odd positions – like against a leaf in this case. So there we were clustered around the plant and ooh-ing and ahh-ing as the flowers began to bloom. We naturally also wanted to take lots of photos – which, let me tell you, is not easy with bland white flowers that are highly reflective, and effective at fending off the camera’s autofocus. I’ll just say, thank goodness for digital cameras! The flower starting to wilt the morning after. It still looks beautiful to me. There was a sequence of shots that I wanted to get, of a bud opening, and the one in the best position happened to be the last flower to open. I set up my camera on the tripod and began to take progressive photos. After an hour, though, I realised that the flower had slowed down, and that the photos looked the same as the previous ones. After another half hour, the bud was still closed, although it had swelled up like a puffer fish. I fully expected it to dramatically burst open, but after another hour, sometime after 2 a.m., I was too tired to care any more. 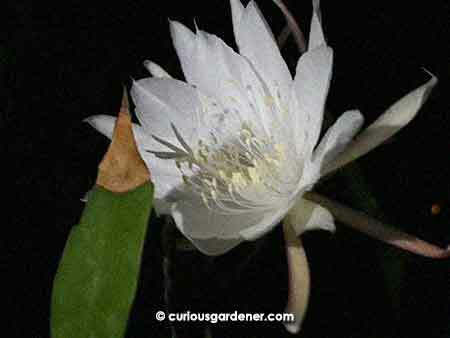 We went to bed, and the next morning when I checked the plant … the flower was still sealed shut! 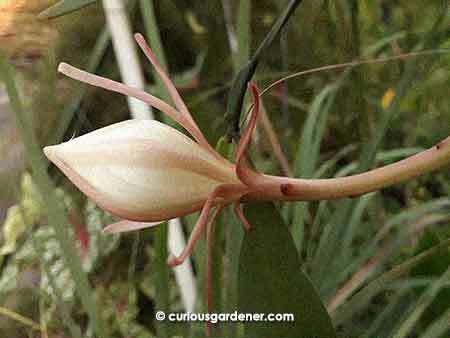 It looked like the sepals were fused at the tip, which held the bud tightly shut. The way it had swelled up reminded me of a lantern, especially when we were shining our flashlights on the bud from the other side. Well, it was the Lantern Festival, after all, so it seemed like the plant wanted to join in the fun and have its own little lantern! The stubborn bud that I now call the lantern keng hwa – taken the morning after. I hope you had a lovely mid-autumn festival, or if you don’t celebrate it, that you at least enjoyed the beautiful full moon. © 2018 curiousgardener.com All rights reserved.